07 December 2018, Kota Kinabalu: MASwings will cease operations of eight (08) domestic routes in Sabah and Sarawak, effective 01 January 2019. The decision to withdraw these return services has been decided by the Government of Malaysia, represented by the Ministry of Transport (MOT), as part of the new Public Service Obligation (PSO) Agreement between MASwings and MOT. All eight routes will be in service until 31 December 2018 (Monday). MASwings regrets any inconvenience caused. All affected passengers have been notified via email, SMS blast and calls; and given the option to change their travels to an earlier date, subject to seat availability, or to be fully refunded. For further enquiries, customers may contact Malaysia Airlines’ 24-hour Call Centre at 1300 88 3000 (within Malaysia) and +6 03 7843 3000 (outside Malaysia) or their respective travel agents and / or visit Malaysia Airlines/MASwings ticket offices. Irresistible and value for money November Deals for travel on MASwings domestic destinations are up for grab from now to 30 November 2018. These deals are being offered inconjuction with the coming school and year end holidays as one of MASwings ongoing initiative and commitment to provide affordable deals and convenient for customers to plan and travel for holidays – an opportunity to savour the beauty and visit places of interests within Sabah and Sarawak has to offer. For this November Deals customers may purchase a one-way all in fares from as low as RM102 from Kota Kinabalu to Labuan; Kuching to Sibu; Sandakan to Tawau; Bintulu to Sibu as well as from Miri to Labuan, Limbang, Mulu and Bintulu. Customers may also purchase the November Deals from as low as RM112 for a one-way all in fares to Lahad Datu, Miri, Sandakan, Tawau and Mulu from Kota Kinabalu; to Bintulu from Kuching and to Sibu from Miri; also from as low as RM132 to Bintulu, Sibu and Miri from Kota Kinabalu and to Mulu from Kuching; and from RM152 to Kuching from Kota Kinabalu and vice versa. It is advisable that customers plan and purchase tickets early to avoid disappointment as these such deals are seeling fast especially with the coming year end. November deals, subject to seat availability, are valid for travel from 07 November to 31 December 2018. The fares above are inclusive of taxes, Carrier Imposed Fee (CIF) and is subject to MASwings’ terms and conditions. A 20kgs of check-in baggage allowance and light refreshments are also included as part of the airline’s continuous effort to offer its best of Malaysian Hospitality for customers during travels. These irresistible deals are available through MASwings / Malaysia Airlines distribution channels i.e. website, ticket offices and appointed travel agents or via Call Centre at 1300 88 3000. Do check out these promotion fares, flight schedules and other information online at www.maswings.com.my. 4 OCTOBER, KOTA KINABALU: MASwings, Your Airline for the people of Sabah and Sarawak, mark its eleventh years of service within and across Sabah, Sarawak and FT Labuan this October. In conjunction with this auspicious celebration, MASwings is offering ‘11 Years Anniversary Specials’ on all its domestic destinations with RM111 for one way all-in fares. This Golden Sale for one way all in fares are up for grabs from 04 October to 31 October, with travel period starting from 06 October to 31 December 2018. It is applicable for all ATR 72-500 flight routes only. "At 11 years in operations, MASwings is proud of its achievement so far despite the operational challenges we face every now and then in meeting the expectation and obligations to serve the people in Sabah, Sarawak and FT Labuan especially in fulfilling the travel need which is vital lifeline to some of the remotest rural communities." said Aminuddin Zakaria, MASwings Chief Executive Officer. "The continuous patronage and support from the people of Borneo have put MASwings at where it is today hence, we are celebrating our 11th Anniversary by offering this Golden Sale of RM111 fares to our customers as our way of saying thank you for the endless support." he further added. Aminuddin also mentioned that MASwings will continue its role in providing a safe and reliable air travel services with continues effort to enhance its inflight offerings and delivering Malaysian Hospitality as its identity at every touch point of the services and operations. In marking this year’s MASwings’ 11th Anniversary celebration, the airline is giving away a total of 111 complimentary tickets to lucky passengers on-board of MASwings selected ATR 72-500 flights throughout the month of October 2018. MASwings Golden Sale fares are inclusive of airport taxes, Carrier Imposed Fee (CIF) and is subject to MASwings’ terms and conditions. It also includes a 20kgs of check-in baggage allowance and light refreshments which is part of the airline’s continuous effort to offer comfort and Malaysian Hospitality during travels. These fares are available through MASwings / Malaysia Airlines website, ticket offices, and appointed travel agents or via 24 hours Call Centre at toll-free number 1300 88 3000. More information on destinations, fares and flight schedules are available on MASwings' website www.maswings.com.my. 03SEP 2018, KOTA KINABALU: Malaysia Day Specials is on offer effective now until 30 September 2018. This irresistible offer which is a continuation of the August 61st Malaysia Independence Month celebration offer is available for travel from this coming 5th September – 31 December 2018. As Malaysia Day which falls on 16th September is very much significant and important to the people of Sabah, Sarawak and FT Labuan, MASwings is giving away this hard to resist deals of September Malaysia Day Specials offering from as low as RM122 for an ‘all-in’ one way economy class fares on all MASwings ATR domestic routes as MASwings way to rejoice and celebrate the occasion with the people of Borneo. MASwings wish to encourage all customers to take advantage and grab this latest 3 days advance purchase fares deals to avoid disappointment as seats are selling fast especially to those weekends vivid travelers who wish to avail these fares for their weekend travelling planned throughout till end year. Malaysia Day Special fares are inclusive of airport taxes, Carrier Imposed Fee (CIF) and is subject to MASwings’ terms and conditions. It is also inclusive of 20kgs check-in baggage allowance and light refreshments which is part of the airline’s continuous effort in offering comfort and Malaysian Hospitality in its services. Fares are available through MASwings / Malaysia Airlines website, ticket offices, and appointed travel agents or via 24 hours Call Centre at toll-free number 1300 88 3000. 16 MAY 2018, KOTA KINABALU: In the spirit of welcoming the period of Ramadan, MASwings is offering yet another irresistible flight promotion from now until 31 May 2018 and available for travel from 18 May 2018 to 31 July 2018. For those who missed out on MASwings’s previous ‘Kaamatan and Gawai Specials’ sale, now is the opportunity to grab this limited two-weeks only all-in one-way amazing offer from as low as RM168 with MASwings’ latest Ramadan Al-Mubarak Deals. As part of the airline's continuous effort to offer convenience and comfort for each passenger during their travel, all MASwings tickets on ATR flights are inclusive of 20kgs check-in baggage allowance and light refreshment. MASwings ‘Ramadan Al-Mubarak’ fares are inclusive of airport taxes, goods and services tax (GST), Carrier Imposed Fee (CIF) and subject to MASwings' terms and conditions. 1 MAY 2018, KOTA KINABALU: Enjoy a special fare with MASwings’ latest ‘Kaamatan and Gawai Specials’ promotion from as low as RM168 all-in one-way to selected destinations within and across Sabah and Sarawak on MASwings ATR services. This limited offer is up for grabs for two-weeks only, from now until 15 May 2018 and open for travel from 3 May 2018 until 30 June 2018. The prolonged travel date offers customer the opportunity to plan their travels and holidays early, with the best services and connectivity across Sabah and Sarawak to be with their loved ones, especially during the coming trip home for Kaamatan and Gawai celebrations. Travelers are advised to grab this opportunity and purchase their tickets early as seats are quick to sell off, especially during festival seasons. All MASwings tickets on ATR flights are inclusive of 20kgs check-in baggage allowance and light refreshment. It is part of the airline's continuous effort to offer convenience and comfort for each passenger during their travel. MASwings ‘Kaamatan and Gawai Specials’ fares are inclusive of airport taxes, goods and services tax (GST), Carrier Imposed Fee (CIF) and subject to MASwings' terms and conditions. The above offers are also available through MASwings / Malaysia Airlines website, ticket offices, and appointed travel agents or via 24 hours Call Centre at toll-free number 1300 88 3000. HOP ON MASWINGS EASTER BONUS DEALS! 02 APRIL 2018, KOTA KINABALU: Book now for that weekend getaway with your loved ones with MASwings’ ‘Easter Bonus Deals’ from as low as RM177 all-in one-way to selected destinations within and across Sabah and Sarawak on MASwings ATR services. Customers are encouraged to grab this exciting promotion to rejuvenate themselves with a well-deserved break and take the opportunity to explore the wonders and beauty of Sabah and Sarawak over a short vacation with family and friends. This limited offer is up for grabs from 2 April until 30 April 2018 and open for travel from 4 April 2018 until 31 May 2018. All MASwings tickets on ATR flights includes 20kgs of check-in baggage allowance and light refreshment for each passenger, as part of the airline’s consistency to offer comfort and safety during travels. As the airline for Sabah and Sarawak, MASwings is constantly looking to provide the best affordable fares across and within Borneo to the community as well as promoting local tourism. MASwings ‘Easter Bonus Deals’ fares are inclusive of airport taxes, goods and services tax (GST), Carrier Imposed Fee (CIF) and subject to MASwings' terms and conditions. FLY WITH MASWINGS CUTI-CUTI SPECIALS! 16 MARCH 2018, KOTA KINABALU: This school holiday, fly with MASwings’ latest promotion ‘Cuti-Cuti Specials’ from as low as RM177 all-in one-way to selected destinations within and across Sabah and Sarawak on MASwings ATR services. Grab this opportunity to plan a holiday filled with the wonders of nature, such as stargazing in Sabah, or trying out mouth-watering local delicacies such as the Mi Kolok in Sarawak. Or even just take a short getaway back to your hometown. This limited offer is up for grabs for two-weeks only, from now until 31 March 2018 and open for travel from 18 March 2018 until 31 May 2018. Additionally, the promotion also offers passengers traveling from Tawau to Tarakan a fare from as low as RM200 all-in one-way, and from Tarakan to Tawau from IDR662,000 all-in one-way. Travelers are advised to purchase their tickets early as the school holidays are considered peak season and seats are quick to sell off. MASwings ‘Cuti – Cuti Specials’ fares are inclusive of airport taxes, goods and services tax (GST), Carrier Imposed Fee (CIF) and subject to MASwings' terms and conditions. 02 MARCH 2018, KOTA KINABALU: Grab MASwings latest promotion, the ‘MARCHvelous Deals’ from as low as RM167 all-in one-way saleable on ALL of MASwings domestic routes on ATR services. This limited offer is up for grabs for two-weeks only, from now until 14 March 2018 and open for travel from 4 March 2018 until 30 April 2018. Additionally, the promotion also offers passengers traveling from Tawau to Tarakan a fare from as low as RM200 all-in one-way, and from Tarakan to Tawau from IDR662,000 all-in one-way. MASwings, as the community airlines, not only connects the big cities of Borneo but also reaches into the hidden gems of what East Malaysia has to offer. Travelers are welcomed to explore the abundance of treasure available in the seas and nature of Sabah and Sarawak by taking advantage of this promotion. It is advisable to plan early for the intended travel since seats are fast selling. MASwings MARCHvelous Deals fares are inclusive of airport taxes, goods and services tax (GST), Carrier Imposed Fee (CIF) and subject to MASwings' terms and conditions. TRAVEL ANYWHERE THIS CHINESE NEW YEAR WITH ONE FARE! 02 FEBRUARY 2018, KOTA KINABALU: In conjunction with the upcoming Chinese New Year celebration, MASwings is offering another of its hard-to-resist festive promotion from as low as only RM158 for an all-in one-way ticket to ALL of MASwings ATR flights within and across Sabah and Sarawak. MASwings’ Chinese New Year Specials are up for grabs from now until 28 February 2018, with travel period from 04 February till 31 March 2018. Additionally, the promotion also offers passengers traveling from Tawau to Tarakan a fare from as low as RM200 all-in one-way, and from Tarakan to Tawau it is offered from IDR662,000 all-in one-way. Customers are urge to take advantage of this latest promotion to travel home and spend this auspicious festival with loved ones and friends. As festival period such as the Chinese New Year is considered high traffic for travelers, be it for those who are celebrating travelling home or for those planning to enjoy a short holiday break, the community airline is requesting all customers to make use of this Chinese New Year Specials to plan their travels in advance to avoid disappointment as seats are fast selling especially during the holidays. MASwings Chinese New Year Specials fares are inclusive of airport taxes, goods and services tax (GST), Carrier Imposed Fee (CIF) and subject to MASwings' terms and conditions. 04 JANUARY 2018, KOTA KINABALU: Plan your holidays early with MASwings latest ‘New Year Sale’ offer, from as low as Only RM148 all-in one-way fare to ALL of MASwings ATR flights within and across Sabah and Sarawak. This promotion is up for grabs from now until 31 January 2018, with the travelling period starting from 07 January 2018 to 28 February 2018. Additionally, the promotion also offers passengers traveling from Tawau to Tarakan from as low as RM200 all-in one-way, and from Tarakan to Tawau flight from IDR662,000 all-in one-way. For this auspicious year 2018, why not start a journey to explore or re-discover the abundant of beauty and unique experiences found throughout Sabah and Sarawak, including neighboring destination: Tarakan, Indonesia. MASwings offer flights from Kota Kinabalu to nine (9) destinations in Sabah and Sarawak, including constantly popular selection such as Miri, Kuching, Sandakan and Federal territory of Labuan. Passengers can also choose to fly from Kuching and Miri to five (5) choices of destinations across Borneo respectively. All MASwings tickets are inclusive of 20kgs check-in baggage allowance and light refreshment, as part of the airline's continuous effort to offer convenience and comfort for each passenger during their travel. MASwings New Year Sale Promotion fares are inclusive of airport taxes, goods and services tax (GST), Carrier Imposed Fee (CIF) and subject to MASwings' terms and conditions. SAY 'YES' TO MASWINGS LATEST YEAR END SALE PROMO! 01 DECEMBER 2017, KOTA KINABALU: Take advantage of MASwings' exciting Year-End Specials to plan your travels and visits across Borneo during this school holidays! MASwings 'YES' Promotion offers from as low as only RM138 all-in one-way fare to ALL of MASwings ATR flights within and across Sabah and Sarawak. This promotion is up for grabs from now until 31 December 2017, with the travelling period starting from 03 December 2017 to 31 January 2018. The promotion, which also coincides with the long school break, hopes to give customers the opportunity to travel back home across Sabah and Sarawak, including Tarakan Indonesia; or even to spend their holidays exploring the beauty of Borneo’s backyard with their friends and family. As year-ends are considered high traffic for travelers, the community airline urge customers to take advantage of this opportunity and plan travels in advance to avoid disappointment. MASwings and Malaysia Airlines' passenger travelling out of East Malaysia are encouraged to check-in for their flights via the self-check-in options available to reduce hassle and save time. MASwings Year End Specials Promotion fares are inclusive of airport taxes, goods and services tax (GST), Carrier Imposed Fee (CIF) and subject to MASwings' terms and conditions. 03 NOVEMBER 2017, KOTA KINABALU: With the year-end holiday's right around the corner, take this time to discover the hidden gems of Sabah and Sarawak with MASwings' latest promotion, 'Cuti- Cuti Deals'; which offers from as low as RM103 all-in one-way on MASwings ATR services. This promotion is available from now until 30 November 2017 and open for travel from 5 November 2017 to 31 January 2018. With the launch of these special deals, MASwings hope to give the local community across Sabah and Sarawak more opportunities to travel home and spend time with their loved ones during the year-end holidays. At the same time, encouraging our customers to discover and explore the exotic wonders and beauty of our own backyard. Additionally, MASwings 10th Anniversary Lucky Draw for ONE HUNDRED free tickets is still ongoing onboard MASwings ATR flights up until 30 November 2017! Customers are able to benefit from this promotion when they fly with the community airline for Sabah and Sarawak and be automatically included for a chance to win one-pair of return flight tickets to any MASwings destination. MASwings Cuti-Cuti Deals offers travelers from Kota Kinabalu to Labuan with fares from as low as RM103 all-in one-way, and from RM113 to Lahad Datu, Tawau, Sandakan, Mulu, and Miri respectively. The all-inclusive offer also starts at RM133 to Bintulu and Sibu; as well as RM153 to Kuching from Kota Kinabalu. For those travelling from Kuching, they will also be able to enjoy fares from as low as RM103 to Sibu and RM113 to Bintulu. Popular destinations such as to Miri and Mulu are also offered at RM133 respectively and to Kota Kinabalu from as low as RM153 one-way from Kuching. Similarly, passengers from Miri can also travel all-inclusive one-way to Labuan, Mulu, Bintulu and Limbang for RM103; and to Sibu for RM113. Offers for other destinations such as from Sandakan to Tawau and from Bintulu to Sibu are also available from as low as RM103. For this promotion, MASwings international flight from Tawau to Tarakan is offered from as low as RM167 all-in one-way and return flight from IDR651,000. All MASwings tickets includes 20kgs of check-in baggage and light refreshment, as part of the airline's consistency to offer comfort for each passenger during travel. As the airline for Sabah and Sarawak, MASwings is constantly looking to provide the best affordable fares across and within Borneo to the community. MASwings Cuti-Cuti Deals are inclusive of airport taxes, goods and services tax (GST), Carrier Imposed Fee (CIF), and subject to MASwings' terms and conditions. The above offers are also available through MASwings / Malaysia Airlines website, ticket offices, and their appointed travel agents or via 24 hours Call Centre at toll-free number 1300 88 3000. 01 October 2017, KOTA KINABALU: MASwings is giving away 100 free tickets to be won for passengers flying between now until 30th November 2017 to any destinations on MASwings ATR services route, in conjunction with the airline's 10th year anniversary. The celebration doesn't end there, MASwings is also offering an irresistible promotion with their offer for RM122 all-in one-way to ALL of MASwings ATR flights within and across Sabah and Sarawak. The promotion is available from now until 31 October 2017 and available for travel from 3 October 2017 to 30 November 2017. MASwings is turning 10 years old in service on 01 October 2017. “Ten years is a very young age for an airline, but we owe it to the people of Sabah, Sarawak as well as the Federal Territory of Labuan to put us where we are today and making us the people's airline. This latest promotion by MASwings is part of our 10th year anniversary celebration, and the 100 free tickets we are giving away randomly on board in the form of lucky draw is our token of appreciation to all our customers for their continuous support”, MASwings Head of Commercial, En. Shauqi Ahmad said. “We have grown so close together with the states of Sabah and Sarawak, creating opportunities for others to discover the beauty of Borneo and connecting families to loved ones and necessities.” Shauqi further added. Additionally, the promotion also offers passengers traveling from Tarakan to Tawau from as low as RM167 all-in one-way, and return flight from IDR651,000. MASwings 10th Year Anniversary Promotion is specially put together to offer customers the opportunity to travel and explore the exotic destinations with MASwings, whether for a leisurely and hassle-free holiday or for business purposes. All MASwings tickets are inclusive of 20kgs check-in baggage allowance and light refreshment, as part of the airline's consistency to offer convenience and comfort for each passenger during travel. MASwings 10th Year Anniversary Promotion fares are inclusive of airport taxes, goods and services tax (GST), Carrier Imposed Fee (CIF) and subject to MASwings' terms and conditions. The above offers are also available through MASwings / Malaysia Airlines website, ticket offices, and their appointed travel agents or via 24 hours Call Centre at toll-free number 1300 88 3000. 16 September 2017, KOTA KINABALU: In commemoration of Malaysia Day, MASwings is offering yet another irresistible flight promotion from now until 30 September 2017 and available for travel from 26 September 2017 to 31 October 2017. For those who missed out on MASwings’s previous three-day Sarawak MATTA Fair flash sale, now is the opportunity to grab an all-in one-way amazing offer from as low as RM117 with MASwings’ latest Malaysia Day Sale. As part of the promotion, passengers travelling from Kota Kinabalu will be able to enjoy one-way all-in fares to Labuan from as low as RM117, and from RM127 to Lahad Datu, Miri, Sandakan, Tawau and Mulu respectively. The all-inclusive offer also starts at RM147 to Bintulu and Sibu; as well as RM167 to Kuching from Kota Kinabalu. Those travelling from Kuching will also be able to enjoy fares from as low as RM117 to Sibu and RM127 to Bintulu. Popular destinations such as to Miri and Mulu are also being offered at RM147 respectively and to Kota Kinabalu from as low as RM167 one-way from Kuching. In addition to the above, passengers from Miri can also travel at all-inclusive one-way to Labuan, Limbang, Mulu and Bintulu for RM117; and to Sibu for RM127. Offers for other destinations such as from Sandakan to Tawau and from Bintulu to Sibu are also available from as low as RM117. Customers travelling to Tarakan from Tawau will also enjoy an all-in-one way fare from as low as RM167, and for a return flight from IDR651, 000. MASwings Malaysia Day Sale is specially put together to offer customers the opportunity to travel within and across Sabah and Sarawak, either on leisure for a hassle free holiday or for business purpose. The affordable pricing offered is part of MASwings ongoing effort to promote unity and love for the nation, on top of the quality services and hospitality, which is in-line with the ‘Ekspresi Negaraku’ pledge mooted by our government. Being the airline to the people of Sabah and Sarawak as well as the Federal Territory of Labuan, MASwings had also recently unveiled its very own ‘Negaraku’ Livery on one of its ATR aircraft, which proudly carries the national flag. MASwings passengers are encouraged to look out for the livery aircraft and share pictures taken on social media. All MASwings tickets are inclusive of 20kgs check-in baggage allowance and light refreshment, as part of the airline’s consistency to offer convenience and comfort for each passenger during travel. MASwings and Malaysia Airlines’ passenger travelling out of East Malaysia are encouraged to check-in for their flights via the self-check-in options available to reduce hassle and save time. MASwings Malaysia Day Sale fares are inclusive of airport taxes, goods and services tax (GST), Carrier Imposed Fee (CIF) and subject to MASwings’ terms and conditions. 08 September 2017, KOTA KINABALU: MASwings is offering a three-day special deals which is available starting today in-conjunction with the 11th Sarawak MATTA Fair. This unbeatable deals offers fare from as low as RM102 all-in one-way on selected MASwings ATR services routes covering flights within Sarawak and crossing between Sarawak and Sabah only. Customers are able to purchase this amazing offer from now until 10 September 2017, with traveling period starting from 10 September 2017 until 31 October 2017. Recently, Sarawak was named the Malaysia’s Favourite Destination at the Malaysian Association of Tour and Travel Agents (MATTA) fair held in Kuala Lumpur. Being a State renowned and much familiar for its very own beauty and culture, and yet not explored by many, MASwings three-day offers is to encourage customers and other keen travel explorers to grab this exciting deals and discover the wonders and beauty of The Land of Hornbills has to offer especially with family and friends. For those travelling from Kuching, they will be able to enjoy fares from as low as RM102 to Sibu and RM112 to Bintulu. Fares to popular destinations such as to Miri and Mulu are also being offered at RM132 respectively and to Kota Kinabalu from as low as RM152 one-way from Kuching. Similarly, passengers from Miri can also travel at all-inclusive one-way fares to Labuan, Limbang, Mulu and Bintulu at RM102, and to Sibu for RM112. Offers for other destinations such as from Bintulu to Sibu are also available from as low as RM102. The three-day deals also covers for passengers travelling from Kota Kinabalu who will also be able to enjoy traveling to the land of hornbills with a one-way all-in fares to Miri and Mulu from as low as RM112. The all-inclusive offer also starts at RM132 to Bintulu and Sibu; as well as RM152 to Kuching from Kota Kinabalu. These fares come with no hidden charges or credit card fees and includes a generous 20kgs of check-in baggage allowance and light refreshments. Being the airline for Sabah and Sarawak, MASwings is obligated to constantly looking at providing the best affordable fares across and within Borneo to the community. MASwings Sarawak Matta Fair Deals are inclusive of airport taxes, goods and services tax (GST), Carrier Imposed Fee (CIF), and are subject to MASwings’ terms and conditions. MASwings Kicks Off National Day Celebration Month with its "Merdeka Specials"
07 August 2017, KOTA KINABALU: MASwings Merdeka Specials promotional fare is back in conjunction with the upcoming Independence Day and Malaysia Day celebration. Coinciding with Malaysia's 60th Independence Day, MASwings latest promotion is offering up to 60% discount starting from as low as RM114 all-in one-way fare and is up for grabs from now until 31 August 2017, with the travelling period starting from 19 August 2017 to 30 September 2017. For this year's celebration, Malaysia is retaining 'Sehati Sejiwa' as its patriotic theme in the hope to further enhance the people's spirit of patriotism and love for the country. MASwings, being the airline for the people of Sabah and Sarawak, is delighted to join the celebration by offering this promotion by encouraging everyone to take this golden opportunity to plan their vacation with families, friends and loved ones to explore the beauty of Borneo especially with the coming short weekend holidays expected in the month of August and September. As part of the promotion, passengers travelling from Kota Kinabalu will be able to enjoy the one-way all-in fares to Labuan from as low as RM114, and from RM124 to Lahad Datu, Miri, Sandakan, Tawau and Mulu respectively. The all-inclusive offer also starts at RM144 to Bintulu and Sibu; as well as RM164 to Kuching from Kota Kinabalu. Those travelling from Kuching will also be able to enjoy fares from as low as RM114 to Sibu and RM124 to Bintulu. Popular destinations such as to Miri and Mulu are also offering discounted fares at RM144 respectively and to Kota Kinabalu from as low as RM164 one-way from Kuching. Similarly, passengers from Miri can also travel all-inclusive one-way to Labuan, Limbang, Mulu and Bintulu for RM114; and to Sibu for RM124. Offers for other destinations such as from Sandakan to Tawau and from Bintulu to Sibu are also available from as low as RM114. On its international route, MAswings is also offering Tarakan bound passengers from from Tawau all-in-one way fare from as low as RM167, and return flight from IDR651, 000. All MASwings tickets includes 20kgs of check-in baggage and light refreshment, as part of the airline's consistency to offer convenience and comfort for each passenger during travel. As the people's airline for Sabah and Sarawak, MASwings is constantly looking to provide the community the best services and affordable fares across and within Borneo. MASwings Merdeka Specials are inclusive of airport taxes, goods and services tax (GST), Carrier Imposed Fee (CIF), and subject to MASwings' terms and conditions. 05 JUN 2017, KOTA KINABALU: MASwings is offering another special deal for the month of June! The latest ‘Cuti-cuti Raya Specials’ promotion will start from as low as RM111 all-in one-way on all MASwings ATR services routes. Purchase is available from now until 30 Jun 2017, with traveling period starting from 7 Jun 2017 until 31 July 2017. MASwings hopes that local communities especially those celebrating the coming ‘Hari Raya Aidilfitri’ will take this opportunity to plan their travels and holidays early in time for the celebration or for the adventurous ones who wish to spend their vacations in-conjunction with this mid-year school break in exploring the wonders of Borneo either with families or friends to grab these irresistible offers subject to seats availability. MASwings ‘Cuti-Cuti Raya Specials’ Promotion offers travelers from Kota Kinabalu to Labuan with fares from as low as RM111 all-in one-way, and from RM121 to Lahad Datu, Miri, Sandakan, Tawau and Mulu respectively. The all-inclusive offer also starts at RM141 to Bintulu and Sibu; as well as RM161 to Kuching from Kota Kinabalu. Those travelling from Kuching will also be able to enjoy fares from as low as RM111 to Sibu and RM121 to Bintulu. One way fares from Kuching to popular destinations such as Miri and Mulu is also being offered from as low as RM141 as well as to Kota Kinabalu from RM161. Similarly, passengers from Miri can also travel by enjoying all-inclusive one-way fares to Labuan, Limbang, Mulu and Bintulu for RM111; and to Sibu for RM121. Offers for other destinations such as from Sandakan to Tawau and from Bintulu to Sibu are also available from as low as RM111. MASwings international flight from Tawau to Tarakan is offered from as low as RM167 all-in-one-way and for return flight, fares are offered from IDR651,000. Coinciding with this irresistible promotion, MASwings will also be hosting an onboard lucky-draws on selected ATR flights throughout the month of June for a chance to win complimentary tickets hosted by Sarawak Tourism Board to the Rainforest World Music Festival (RWMF) which will be held from 14 – 16 July 2017 in Kuching. This effort is in line with MASwings on-going support towards promoting tourism events in Sarawak. All MASwings tickets includes 20kgs of check-in baggage and light refreshment, as part of the airline’s consistency to offer comfort for each passenger during travel. Being the airline for Sabah and Sarawak, MASwings is constantly looking to provide the community the best affordable fares across and within Borneo. MASwings ‘Cuti-Cuti Raya Specials’ Promotion are inclusive of airport taxes, goods and services tax (GST), Carrier Imposed Fee (CIF), and are subject to MASwings’ terms and conditions. 05 MAY 2017, KOTA KINABALU: In conjunction with the upcoming Holy Month of Ramadhan, MASwings is offering a hard-to-resist offer from as low as RM103 all-in one-way on all MASwings ATR services. Purchase is available from now until 31 May 2017, with traveling period starting from 7 May 2017 until 30 June 2017. With the launch of these special deals, MASwings’ hope to give the local community across Sabah and Sarawak more opportunities to travel home and spend time with their loved ones during the Ramadhan month. MASwings Ramadhan Kareem Promotion offers travelers from Kota Kinabalu to Labuan with fares from as low as RM103 all-in one-way, and from RM113 to Lahad Datu, Tawau, Sandakan, Mulu, and Miri respectively. The all-inclusive offer also starts at RM133 to Bintulu and Sibu; as well as RM153 to Kuching from Kota Kinabalu. During this promotion, MASwings international flight from Tawau to Tarakan is offered from as low as RM157 all-in one-way and return flight from IDR651,000. All MASwings tickets includes 20kgs of check-in baggage and light refreshment, as part of the airline’s consistency to offer comfort for each passenger during travel. As the airline for Sabah and Sarawak, MASwings is constantly looking to provide the best affordable fares across and within Borneo to the community. MASwings Ramadhan Kareem Promotion are inclusive of airport taxes, goods and services tax (GST), Carrier Imposed Fee (CIF), and subject to MASwings’ terms and conditions. Travel Advisory - Info Update on MASwings Flights to-from Sibu 9 Apr 2017 due extended closure of Sibu Airport on 9 April 2017. 09 April 2017, KOTA KINABALU: Sibu Airport will be temporarily closed until 8.00 pm today following the incident of flight MH2718 that skidded upon landing on Saturday 8th April 2017. Sibu Airport will be temporarily closed until 8.00 pm today following the incident of flight MH2718 that skidded upon landing on Saturday 8th April 2017. All affected passengers are being notified of the flight cancellations. They will be reallocated to the next available flight once Sibu Airport is open for operation. We regret for the inconveniences caused to our passengers. MASwings LATEST PROMOTION WHAT A FARE! 03 April 2017, KOTA KINABALU: MASwings is bringing back another amazing offer with its latest ‘What A Fare!’ Promotion starting from as low as RM98 all-in one-way on all MASwings’ ATR services. Ticket purchase is available from now until 30 April 2017, with traveling period starting from 5 April 2017 until 31 May 2017. All MASwings’ tickets includes 20kgs of check-in baggage and light refreshment serve for each passenger, as part of the airline’s consistency to offer convenience and comfort during travels. As the people’s airline for Sabah and Sarawak, MASwings is constantly working to provide the best affordable fares across and within Borneo for the community as well as in promoting its local tourism. ‘What A Fare!’ Promotion offers travelers from Kota Kinabalu to Labuan with fares from as low as RM98 all-in one-way, and from RM108 to Lahad Datu, Tawau, Sandakan, Mulu, and Miri respectively. The all-inclusive offer also starts at RM128 to Bintulu and Sibu; as well as RM148 to Kuching from Kota Kinabalu. Those travelling from Kuching will also be able to enjoy fares from as low as RM98 to Sibu and RM108 to Bintulu. Popular destinations such as to Miri and Mulu are also offered at RM128 respectively and to Kota Kinabalu from as low as RM148 one-way from Kuching. Similarly, passengers from Miri can also travel at all-inclusive one-way to Labuan, Mulu, Bintulu and Limbang for RM98; and to Sibu for RM108. Offers for other destinations such as from Sandakan to Tawau and from Bintulu to Sibu are also available from as low as RM98. While MASwings international flight from Tawau to Tarakan is offered from as low as RM147 all-in one-way and return flight from IDR636, 000. Other destinations promotion can be found on MASwings website. MASwings What A Fare! Promotion are inclusive of airport taxes, goods and services tax (GST), Carrier Imposed Fee (CIF), and subject to MASwings’ terms and conditions. MASwings will be reducing its ATR flights' frequency on few selected routes in order to allow the aircraft fleet to undergo mandatory maintenance plan which is scheduled from 20th February 2017 until the end of the year. Eight (8) ATR aircraft will be going for Heavy Maintenance Visit (HMV) in 2017. This visit is mandatory by the aircraft manufacturer to ensure the operating aircraft meets the airworthiness requirements and standards. MASwings recently announced the refurbishment program called “Fleet Improvement Program” or FIP to improve the aircraft reliability and customer experienced. MASwings has obtained the necessary approval from Ministry of Transportation (MOT) Malaysia to reduce flight frequency of selected routes prior to this announcement. MASwings currently operates a total of 818 flights weekly to all of its ATR operated destinations. The planned reduction of flights will have minimal impact at 8.6% from the total flights currently in rotation. Despite the frequency reduction, MASwings is confident that this temporary measures will not affect the travel plan of its customers. The remaining frequency between 14x weekly to 28x weekly into and from these destinations are still adequate to provide frequency spread and seat capacity to meet the demand of passengers travelling on these routes and beyond other MASwings’ points. MASwings also wishes to reiterate that the scheduled maintenance program including the Fleet Improvement Program (FIP) will improve on-time performance, customer experienced and win back confidence to fly on MASwings. In view of the frequency reduction and retiming of services arising from this exercise, MASwings have initiated reallocation exercise to affected passengers by offering options for new date and departure time or full refund at MASwings/ Malaysia Airlines ticket offices. On-going efforts to contact affected passengers due to the cancellation and retiming of flights are currently being carried out. Notwithstanding that, passenger whom had purchased their tickets earlier for flights after 20th February 2017 can confirm the status of their flights either by contacting MASwings/ Malaysia Airlines ticket offices or their travel agents or via 24 hours Call Centre at toll-free number 1300 88 3000.On-going efforts to contact affected passengers due to the cancellation and retiming of flights are currently being carried out. Notwithstanding that, passenger whom had purchased their tickets earlier for flights after 20th February 2017 can confirm the status of their flights either by contacting MASwings/ Malaysia Airlines ticket offices or their travel agents or via 24 hours Call Centre at toll-free number 1300 88 3000. MASwings apologise for the inconveniences caused to passengers and thank the public for their understanding. MASwings is the regional community airline for East Malaysia. The Airline was officially launched on 1st October 2007 with its operation mainly focused on the Rural Area Services (RAS) routes within Sabah and Sarawak, which connects the local community from their hometown to the big cities. Currently, MASwings is serving a network of 24 destinations and operates with ten (10) 64-seater ATR 72-500, an advanced turboprop aircraft which connects Kota Kinabalu, Kuching, Miri and Labuan International Airports to major towns and cities in East Malaysia. MASwings also offers flights to the neighbouring city, Tarakan, Indonesia. Otter, out of Miri for the RAS routes. MASwings offers affordable fares, convenient schedules and extensive connections within and across Sabah and Sarawak complementing its tagline MASwings – Your Airline. 16 JANUARY, KOTA KINABALU: Celebrate this Chinese New Year with up to 80% discount on MASwings’ irresistible Chinese New Year Prosperity Deals! This promotion starts at one-way all-in fare from as low as RM83 on all MASwings ATR services and is up for grabs from 16 January 2017 until 12 February 2017, with travel period starting from 18 January 2017 until 31 March 2017. This offer is part of MASwings initiative to constantly offer the best affordable fares across and within Borneo to the people of Sabah and Sarawak as well as encouraging local communities to explore the beauty and wonders of our own backyard. The price offered also includes 20kgs of check-in baggage and light refreshment for each passenger, maintaining the airline’s offer of comfort and safety during travels. For passengers travelling from Kota Kinabalu will be able to enjoy the one-way all-in fares to Labuan from as low as RM83 and from RM93 to Tawau, Sandakan, Lahad Datu, Mulu, and Miri respectively. The all-inclusive offer also starts at RM113 to Bintulu and Sibu; as well as RM133 to Kuching from Kota Kinabalu. Those travelling from Kuching will also be able to enjoy fares from as low as RM83 to Sibu and RM93 to Bintulu. Popular destinations such as to Miri and Mulu are also offered at RM113 respectively and to Kota Kinabalu from as low as RM133 one-way from Kuching. Similarly, passengers from Miri can also travel all-inclusive one-way to Labuan, Mulu, Bintulu and Limbang for RM83; and to Sibu for RM93. Offers for other destinations such as from Sandakan to Tawau and from Bintulu to Sibu are also available from as low as RM83. Other destinations promotion can be found on MASwings website. MASwings and Malaysia Airlines’ passenger travelling out of East Malaysia are encouraged to check-in for their flights via the self-check-in options available to reduce hassle and save time, especially during the upcoming festive season. MASwings Chinese New Year Prosperity Deals promotion fares are inclusive of airport taxes, goods and services tax (GST), Carrier Imposed Fee (CIF), and subject to MASwings’ terms and conditions. 6 DECEMBER 2016, KOTA KINABALU: MASwings celebrates the year-end holidays with another irresistible promotion! The MASwings’ Year End Specials promotion starts from one-way all-in fare as low as RM79 on all MASwings routes and is up for grabs from now until 31 December 2016, with travel period starting from 8 December until 31 January 2017. As part of the promotion, passengers travelling from Kota Kinabalu will be able to enjoy the one-way all-in fares to Labuan from as low as RM79 and from RM89 to Tawau, Sandakan, Lahad Datu, Mulu, and Miri respectively. The all-inclusive offer also starts at RM109 to Bintulu and Sibu; as well as RM129 to Kuching from Kota Kinabalu. Those travelling from Kuching will also be able to enjoy fares from as low as RM79 to Sibu and RM89 to Bintulu. Popular destinations such as to Miri and Mulu are also offered at RM109 respectively and to Kota Kinabalu from as low as RM129 one-way from Kuching. Similarly, passengers from Miri can also travel all-inclusive one-way to Labuan, Mulu, Bintulu and Limbang for RM79; and to Sibu for RM89. Offers for other destinations such as from Sandakan to Tawau and from Bintulu to Sibu are also available from as low as RM79. In addition to this promotion, MASwings is also offering Tarakan bound passengers from Tawau all-inclusive one-way fare from as low as RM138. MASwings and Malaysia Airlines’ passenger travelling out of East Malaysia are encouraged to check-in for their flights via the self-check-in options available to reduce hassle and save time. For up to 48-hours prior to a flight, customers can choose to either check in via MHweb check-in which could be found through the website at www.maswings.com.my and www.malaysiaairlines.com. Alternatively, customers can also choose to use the Self Service Check-in Kiosks located at selected airports across Sabah and Sarawak. MASwings Year End Specials promotion fares are inclusive of airport taxes, goods and services tax (GST), Carrier Imposed Fee (CIF), and subject to MASwings’ terms and conditions. This latest MASwings RM62 JUST4U Promotion features an all inclusive one-way fares offered to all of MASwings’ domestic routes and is available from now until 31st October 2016, with a travel period starting from 3rd October till 30th November 2016. MASwings encourage travelers to join the celebration by visiting and delighting in the wonderful array of Sabah and Sarawak’s local treasure; and urge customers to take advantage of this opportunity and plan travels in advance to avoid disappointment. As the airline’s fare becomes increasingly competitive, more people have made MASwings their preferred choice of travel in Sabah and Sarawak. Furthermore, passenger traveling on these special fares continues to enjoy all the services offered onboard, including refreshments, up-to 20KG check-in baggage allowance on economy, convenient schedules with higher frequencies, and many more benefits. This is also part of the airline’s effort to give back and appreciate the people who have supported MASwings towards its successes throughout the years, which bring the community airline to where it is today. While continuously maintaining its competitive edge in a challenging industry, MASwings’ main objective still remains for the benefit of Sabah and Sarawak, which is to support the community’s growth by offering the best services at affordable fares across and within Borneo. MASwings and Malaysia Airlines’ passenger travelling out of East Malaysia are encouraged to check-in for their flight via the self-check-in options available to reduce hassle and save time. MASwings’ RM62 JUST4U promotion are inclusive of airport taxes, goods and services tax (GST), Carrier Imposed Fee (CIF), and subject to MASwings ‘ terms and conditions. These offers are available through MASwings / Malaysia Airlines website, ticket offices, and appointed travel agents or via 24 hours Call Centre at toll-free number 1300 88 3000. MASwings wishes to apologize for the flight cancellations that had occurred today. The unexpected cancellations were due to the grounding of 3 of our aircraft for technical inspection which is part of the maintenance requirements. Our team has contacted the affected passengers to notify the cancellations and reallocated them to the next available flight. Insofar we were able to allocate our passengers with minimal disruptions to their travel plan. MASwings expects to cancel several flights today and tomorrow but rest assured all those affected will be notified accordingly as per our standard operating procedures. MASwings regrets the inconveniences caused and will keep all passengers and agents notified on the latest progress. 08 SEPTEMBER 2016, KOTA KINABALU: MASwings launches another irresistible offer for the month of September, in conjunction with Malaysia Day which falls on the 16th September 2016. Super September promotion offers an all-in one-way fare starting from as low as RM79 on all MASwings routes and is up for grabs from now until 28 September 2016, with travel period starting from 10 September until 30 September 2016. The promotion, which also coincides with the upcoming school break, hopes to give customers the opportunity to travel back home across Sabah and Sarawak, including Tarakan Indonesia; or even to spend their holidays exploring the beauty of Borneo’s backyard with their friends and family. This amazing offer is a prelude to MASwings’ coming 9th Anniversary celebration this year. As part of the promotion, passengers travelling from Kota Kinabalu will be able to enjoy the one-way all-in fares to Labuan from as low as RM79 and from RM89 to Lahad Datu, Sandakan, Tawau, Miri and Mulu respectively. The all-inclusive offer also starts at RM109 to Bintulu and Sibu; as well as RM129 to Kuching from Kota Kinabalu. Similarly, passengers from Miri can also travel all-inclusive one-way to Mulu, Labuan, Bintulu and Limbang for RM79; and to Sibu for RM89. Offers for other destinations such as from Sandakan to Tawau and from Bintulu to Sibu can be found on MASwings’ website. For up to 48-hours prior to a flight, customers can choose to either check in via MHweb check-in which could be found through the website at www.maswings.com.my and www.malaysiaairlines.com. Alternatively, customers can also choose to use the Self Service Check-in Kiosks located at selected airports across Sabah and Sarawak. MASwings Super September promotion fares are inclusive of airport taxes, goods and services tax (GST), Carrier Imposed Fee (CIF), and subject to MASwings’ terms and conditions. FRIDAY, 02 SEPTEMBER 2016, KOTA KINABALU: Effective Monday, 05 September 2016, Malaysia Airlines Berhad (MAB) and MASwings Sdn Bhd Ticket Offices in Sabah and Sarawak’s operating hours will be revised to operate from 8am until 5pm daily from Monday to Sunday. For customers who wish to perform ticketing related functions during non operating hours they are advised to visit Malaysia Airlines website : www.malaysiaairlines.com or MASwings website : www.maswings.com.my. Customers may also contact our Malaysia Airlines Call Centre at 1-300-88-3000 (in Malaysia) or 03-78433000 (outside Malaysia) and/or to visit the nearest Travel Agents for assistance. With this latest changes in the operating hours of all ticket offices in Sabah and Sarawak, customers are advised to plan for their travel arrangement way ahead to avoid inconveniences especially for last minute travelers. MASwings MERDEKA SPECIAL PROMOTIONAL FARE IS BACK! 13 JULY, KOTA KINABALU: In conjunction with the upcoming Malaysia’s National day celebration, MASwings has rolled out an exciting offer to all of its domestic destinations. This year, Malaysia has retained the previous National Day tagline ‘Sehati Sejiwa’, in hope to enhance the people’s spirit of patriotism and love for the country. Being the airline of the people of Sabah and Sarawak, MASwings holds true to this belief and continuously strives to support the community’s growth by offering the best services at affordable fares across and within Borneo. The latest MASwings Merdeka Special Promotion features an all inclusive one-way fares offered to all of MASwings’ domestic routes and is available from now until 31 August 2016, with a travel period starting from 16 July 2016 – 04 September 2016. Passengers travelling from Kota Kinabalu will be able to enjoy the one-way all-in fares to Labuan starting from RM 135, and to Sibu starting from RM 194 while Lahad Datu, and Sandakan is offered from as low as RM 147. This all-inclusive offer also starts at RM 153 to Tawau, RM 171 to Mulu, and RM 188 to Bintulu. Popular destinations such as Miri and Kuching are also offered from RM 159 and RM 229 respectively from Kota Kinabalu. Those travelling from Miri will also be able to enjoy this promotion from as low as RM 115 to Mulu, RM 118 to Limbang, and Bintulu, as well as RM 124 and RM 147 to Labuan and Sibu respectively. Similarly, passengers from Kuching can also travel with the all-inclusive one-way fare to Bintulu and Miri for RM 188, Sibu for RM 141, Mulu for RM 194 and Kota Kinabalu for RM 229, by participating in the same amazing offer. This promotion also includes offers for passengers from Sandakan to Tawau from as low as RM118 and passengers from Bintulu to Sibu starting from only RM 112. MASwings’ Merdeka Specials promotion are inclusive of airport taxes, goods and services tax (GST), Carrier Imposed Fee (CIF), and subject to MASwings ‘ terms and conditions. The above offers are also available through MASwings/ Malaysia Airlines ticket offices, and their appointed travel agents or via the 24 hours Call Centre at toll-free number at 1300 88 3000. More information on destinations, fares and flight schedules are available on MASwings’ website www.maswings.com.my. 03 JUNE, KOTA KINABALU: In conjunction with the upcoming holy month of Ramadhan, MASwings is offering yet another amazing flight promotion. This promotion offers an all-in one-way fare starting from as low as RM79 on all MASwings domestic routes and is up for grabs from now until 30 June 2016, with travel period starting now until 31 July 2016. The prolonged travel date offers customer the opportunity to plan their travels and holidays early, with the best services and connectivity across Sabah and Sarawak to be with their loved ones, especially during the coming trip home for Syawal celebration. Passengers travelling from Kota Kinabalu will be able to enjoy the one-way all-in fares to Labuan from as low as RM79 and from RM89 to Lahad Datu, Sandakan, Tawau, Miri, and Mulu respectively. The all-inclusive offer also starts at RM109 to Bintulu and Sibu, and RM129 to Kuching from Kota Kinabalu. Similarly, passengers from Miri can also travel all-inclusive one-way to Mulu, Labuan, Bintulu and Limbang for RM79, and to Sibu for RM89 by partaking in the same amazing offer. Other list of destinations can be found on MASwings’ website. For up to 48-hours prior to a flight, customers can choose to either check in via MHweb check-in which could be found through the website at www.maswings.com.my and www.malaysiaairlines.com. Alternatively, customers can also choose to use the Self Service Check-in Kiosks located at selected airports across Sabah and Sarawak. Smartphone users may also download the free MHmobile app for easy check-in. MASwings Ramadhan promotion fares are inclusive of airport taxes, goods and services tax (GST), Carrier Imposed Fee (CIF), and subject to MASwings’ terms and conditions. 08 MARCH, KOTA KINABALU: MASwings is rolling out yet another promotion for the benefit of community travel with its 'Grab The Fare!' campaign. This campaign is also launched in-conjunction with MATTA Travel Fair 2016 which is happening from 11th to 13th March this year. These one-way all-in fares are offered to all MASwings' domestic routes and are up for grabs from now until 29 May 2016, with travel period starting 10 March 2016 – 29 May 2016. With the travel period coinciding with Malaysia's 1st term School Holiday, MASwings hope that local communities would take this opportunity to explore the beauty within our own backyard while bringing together families, friends and loved ones across Sabah and Sarawak. Passengers travelling from Kota Kinabalu will be able to enjoy the one-way all-in fares to Labuan starting from as low as RM81, and RM91 to Tawau, Sandakan, Lahad Datu, Mulu and Miri. This all-inclusive offer also starts at RM111 to Bintulu and Sibu as well as RM131 to Kuching. Those travelling from Kuching will also be able to enjoy fares as low as RM81 to Sibu, RM91 to Bintulu, and RM131 to Kota Kinabalu respectively. Popular destinations such as Miri and Mulu are also offered at RM111 respectively one-way from Kuching. Similarly, passengers from Miri can also travel to Labuan, Limbang, Bintulu, and Mulu, starting from RM81 one-way, and RM91 to Sibu, by participating in the same amazing offer. MASwings' 'Grab The Fare' promotion fares are inclusive of airport taxes, goods and services tax (GST), carrier imposed fee (CIF), and are subject to MASwings' terms and conditions. The above offers are also available through MASwings / Malaysia Airlines ticket offices, and via 24 hours Call Centre at toll-free number 1300 88 3000. 05 FEBRUARY, KOTA KINABALU: MASwings is offering a great value-for-money promotion to all of the airline’s local destinations with an all-in fares from RM86 one-way in conjunction with the Chinese New Year celebration this February. With the launch of this promotion, MASwings’ hope to give the local community more opportunities to travel home for Chinese New Year and spend the auspicious festival with loved ones and friends across Sabah and Sarawak. The all-in one-way fares will start from as low as RM86 on all MASwings domestic routes and are up for grabs from 05 February until 28 February 2016, with travel period from 08 February till 31 March 2016. Passengers travelling from Kota Kinabalu will be able to enjoy the all-in one-way fares starting from RM86 to Labuan and RM96 to Tawau, Sandakan, Lahad Datu, Mulu and Miri. The all-inclusive offer also starts at RM116 to Bintulu and Sibu as well as from RM136 to Kuching from Kota Kinabalu. Those travelling from Kuching will also be able to fly with fares from as low as RM86 to Sibu, RM96 to Bintulu, and RM116 to Miri and Mulu. The promotion also offers all-in one-way fares from RM136 from Kuching to Kota Kinabalu. Similarly, passengers from Miri can also travel on this all-inclusive one-way promotion to Labuan, Limbang, Bintulu and Mulu for RM86, or to Sibu for RM96 by partaking in the same amazing offer. Other list of destinations can be found on MASwings’ website. For up to 48-hours prior to a flight, customers can choose to either check in via MHweb check-in which could be found through the website at www.maswings.com.my and www.malaysiaairlines.com or MHmobile check in on flymas.mobi. Alternatively, customers can also choose to use the Self Service Check-in Kiosks located at Kota Kinabalu International Airport (KKIA) and Kuching International Airport (KIA), which currently has six (6) kiosks available at each respective airport. MASwings Chinese New Year promotion fares are inclusive of airport taxes, goods and services tax (GST), carrier imposed fee (CIF), and subject to MASwings’ terms and conditions. 29 OCTOBER, KOTA KINABALU: MASwings is extending its ‘Celebra8th Anniversary’ promotion which offers up to 80% discount as base fare starting from as low as RM24 one-way to all MASwings’ domestic destinations. The promotion’s selling period starts now until 31st January 2016 and traveling period has also been extended from now until 31st March 2016. The popular 8th Anniversary promotional deals is extended due to the encouraging demand from the community of Sabah and Sarawak. More passengers are travelling with MASwings as fares are becoming increasingly competitive in the market. Also, guests travelling on the special fares continue to enjoy all the services including refreshments on board, convenient schedules, minimum 20kg baggage allowance for economy class and many other benefits. MASwings offer flights from Kota Kinabalu to nine (9) destinations in Sabah and Sarawak, including highly popular selection such as Miri, Kuching, Sandakan and Labuan. Passengers can also choose to fly from Kuching and Miri to five (5) choices of destinations across Borneo respectively. This promotion was launched last 8th October 2015 in conjunction with MASwings’ 8th Anniversary Celebration. Passengers can make their bookings through MASwings / Malaysia Airlines ticket offices, and via Malaysia Airlines 24 hours Call Centre at toll-free number 1300 88 3000. 8 OCTOBER, KOTA KINABALU: MASwings, Your Airline, mark its eight years of flying the skies of Sabah and Sarawak this October. In conjunction with this celebration, the airline offers its 'Celebra8th Anniversary' promotion with up to 80% discount on all its domestic destinations with fares starting from as low as RM88. This promotion is a 'one-way all-inclusive' fares offered to all MASwings' domestic routes and is up for grabs from now until 25 October 2015, with travel period starting 10 October 2015 – 13 November 2015. "The number eight (8) is well known to associate with 'wealth' and 'fortune', and we have designed for the number to symbolize an 'infinity' cycle, which hopes to bring good fortune for a long time with the celebration of our anniversary." MASwings' Chief Executive Officer, Captain Ritzerwan Rashid remarked. He also mentioned that MASwings have constantly pursued to provide a good and safe connectivity between the local communities. "We at MASwings are immensely grateful for the support by the people of Sabah and Sarawak, and in conjunction with our eighth anniversary; we are offering the opportunity for everyone to fly with us and join the celebration." To mark MASwings' 8th Anniversary celebration, the airline will also be giving away 888 flight tickets to any MASwings' destinations for passengers who travel on MASwings until 13th November 2015. During this 'Celebra8th Anniversary' promotion, passengers travelling from Kota Kinabalu will be able to enjoy the one-way all-in fares starting from RM88 to Labuan, as well as from RM98 to Lahad Datu, Mulu, Miri, Tawau, and Sandakan. This all-inclusive offer also starts from RM118 to Bintulu and Sibu as well as RM138 to Kuching. Those travelling from Kuching will also be able to enjoy fares from as low as RM88 to Sibu and RM98 to Bintulu. Popular destinations such as Miri and Mulu are also offered at RM118 one-way from Kuching. Similarly, passengers from Miri can also travel to Bintulu, Mulu, Limbang and Labuan, starting from RM88 one-way, and RM98 to Sibu by participating in this hard-to-resist offer. MASwings 'Celebra8th Anniversary' fares are inclusive of airport taxes, goods and services tax (GST), fuel and insurance charges, and subject to MASwings' terms and conditions. MASwings' and Malaysia Airlines' passenger travelling out of East Malaysia are encouraged to check-in for their flights via the self-check-in options available to reduce hassle and save time. A MASwings Twin Otter (DHC6) aircraft, bearing registration no. 9M-SSB,operating flight MH3553 from Miri veered off the runway at Mukah airport upon landing at 1410 hours today. All eight passengers and two operating crew were unhurt and disembarked safely. There was no damage to the aircraft. As safety is of utmost importance to the airline, the aircraft is currently undergoing engineering inspection before returning to service. MASwings continues to uphold is obligation to provide safe and efficient services to the customers. 20 AUGUST, KOTA KINABALU: In celebration of Hari Merdeka and Hari Malaysia 2015, MASwings has announced a Merdeka Specials Promotion for all its domestic destinations with fares starting from as low as RM94. This promotion is all-inclusive with a one-way all-in fares offered to all of MASwings’ domestic routes and is up for grabs from now until 6 September 2015, with travel period starting 22 August 2015 – 18 September 2015. Passengers travelling from Kota Kinabalu will be able to enjoy the one-way all-in fares to Labuan starting from RM99, and to Lahad Datu and Sibu from as low as RM105. This all-inclusive offer also starts at RM107 and RM116 to Tawau and Mulu, and RM127 to Sandakan. Popular destinations such as Miri and Kuching are also offered at RM110 and RM144 respectively one-way from Kota Kinabalu. Those travelling from Kuching will also be able to enjoy fares as low as RM102 to Sibu, RM124 to Miri and Bintulu, as well as RM127 and RM144 to Mulu and Kota Kinabalu respectively. Similarly, passengers from Miri can also travel to Bintulu, Mulu, Sibu, and Labuan, starting from RM94 one-way, and RM105 to Limbang, by participating in the same amazing offer. MASwings Merdeka Specials promotion fares are inclusive of airport taxes, goods and services tax (GST), fuel and insurance charges, and subject to MASwings’ terms and conditions. 10 JUNE, SABAH: Following the strong earthquake that hit Sabah, MASwings, the regional community airline for Sabah and Sarawak will be initiating a donation drive from 10 June 2015 until 30 June 2015 to help raise funds for those affected by the quake. The airline has also pledged to help the victims with an initial donation of RM10,000 as its commitment to help those in need. The public may make their donations at any Malaysia Airlines and MASwings’ check-in counters, ticketing offices, as well as onboard MASwings’ flights. For further inquiry regarding MASwings’ #SabahEarthquake Donation Drive campaign or alternative ways of making donations, please contact MASwings Corporate Communications Department for Ms Ashilla Sabin at [email protected] or call 088-515593. Concurrently, Malaysia Airlines Group will be running an internal donation campaign for two weeks to help ease the burdens of the victims. This campaign will also reach out to its colleagues in its stations worldwide. The Malaysia Airlines family is saddened by this incident and our thoughts and prayers are with the people of Sabah. 02 JUNE, KOTA KINABALU: In conjunction with the upcoming holy month of Ramadhan, MASwings is offering a great value-for-money promotion of up to 80% discount to all local MASwings’ destinations. All-in one-way fares starting from as low as RM94 on all MASwings domestic routes are up for grabs from now until 30 June 2015. Travel period is from 16 June till 10 July 2015. With these Special Deals during the Holy Month of Ramadan, MASwings’ makes it possible for customers to make it home to be break fast or ‘berbuka puasa’ with loved ones and friends across Sabah and Sarawak. Passengers traveling from Kota Kinabalu will be able to enjoy all-in one-way fares to Labuan from as low as RM99, with RM105 to Lahad Datu and Sibu respectively. The all-inclusive offer also starts at RM107 to Tawau, RM110 to Miri and RM144 to Kuching. Those traveling from Kuching will also be able to enjoy fares as low as RM102 to Sibu, RM124 to Miri and Bintulu, as well as RM127 to Mulu. Similarly, passengers from Miri can also travel all-inclusive one-way to Mulu, Labuan, and Sibu, for RM94, or Bintulu for RM102 and Limbang for RM105, by partaking in the same amazing offer. Other list of destinations can be found on MASwings’ website. MASwings and Malaysia Airlines’ passenger traveling out of East Malaysia are encouraged to check-in for their flights via the self-check-in options available to reduce hassle and save time. For up to 48-hours prior to a flight, customers can choose to either check in via MHweb check-in which could be found through the website at www.maswings.com.my and www.malaysiaairlines.com or MHmobile check in on flymas.mobi. Alternatively, customers can also choose to use the Self Service Check-in Kiosks located at Kota Kinabalu International Airport (KKIA) and Kuching International Airport (KIA), which currently has six (6) kiosks available at each respective airport. Smart phone users may also download the free MHmobile app for easy check-in. 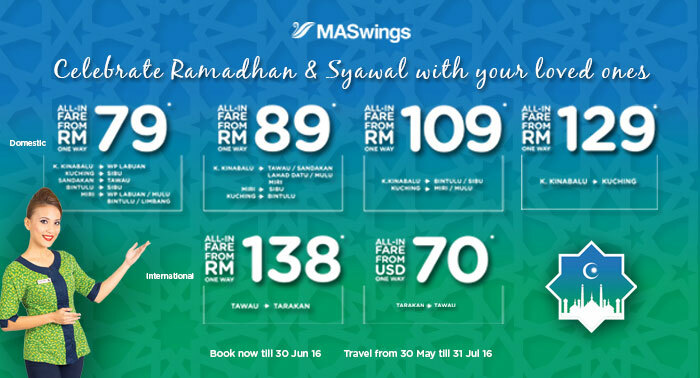 MASwings Ramadhan promotion fares are inclusive of airport taxes, goods and services tax (GST), fuel and insurance charges, and subject to MASwings’ terms and conditions. 30 JANUARY 2015, KUCHING: MASwings will be colouring the night sky with its signature colours from the launching of ‘THE NEW BEGINNING’ at Kuching Waterfront tonight. The event will be officiated by both the Sarawak and Sabah Minister of Tourism, YB Datuk Amar Abg Abd Rahman Zohari Tun Abg Hj Openg and YB Datuk Seri Panglima Masidi Manjun to represent the communities. MASwings ‘THE NEW BEGINNING’ is held as a thank you for the people of Sarawak and Sabah for their continuous support towards the airline since its conception in 2007. At the launching of the event, MASwings will also unveil their new ground staff uniform with a new shade of green –the signature of growth, and to mark the start of an enhanced customer service practice, embodying the Malaysian spirit. In conjunction with the celebration, MASwings is also offering X-FARES promotions with base fares from as low as RM21, to selected ATR domestic destinations. During this promotion, passengers travelling from Kuching will be able to enjoy an all in one-way fares to Bintulu, Sibu Miri, Mulu and Kota Kinabalu from as low as RM80 and those travelling from Kota Kinabalu to Sandakan, Tawau, Lahad Datu and Labuan will also enjoy the same all in one-way fares from RM80. Not forgetting travellers from Miri who may also enjoy the same promotion to Kota Kinabalu, Kuching, Mulu and Labuan respectively. MASwings’ irresistible X-FARES promotions are up for grabs from now until 23 June 2015, with travel period from 6 February 2015 until 30 June 2015. The RM21 base-fares are not inclusive of airport taxes, fuel and insurance charges, which start from RM59 one-way, and subject to MASwings terms and conditions. MASwings Chief Executive Officer, Captain Ritzerwan said, "More people are travelling with us as our fares are becoming increasingly competitive, and guests traveling on these special fares will continue to enjoy all the services including refreshments on board, convenient schedules with more frequencies, on time departures, maximum 20kg baggage allowance for economy class and many other benefits. We encourage travelers to visit and delight in the wonderful array of local destinations, and we urge customers to take advantage of this opportunity to plan their travel in advance to avoid disappointment”. “With the encouraging demand we are confident that the increase in flight frequency will help MASwings to expand and build scale in its core domestic markets which played an important role to contribute to the local economic growth of Sabah and Sarawak.” He added, announced MASwings’ intention to expand. MASwings ‘THE NEW BEGINNING’ event will last for two days from 30 to 31 January 2015 at Kuching Waterfront from 10am to 6pm and will feature great fun-filled activities with conjunction with various bodies across tourism, aviation and much more industries. Visitors of the fair will be able to get first hand exclusive X-FARES promotion deals to any of the selected destinations within Sabah and Sarawak and stand a chance to win various merchandise giveaways by participating in the booth activities. Apart from that, there will also be an array of performances as well as ‘special’ appearances from MASwings’ in-house talent to entertain the crowd. 15 JANUARY, KOTA KINABALU: MASwings, The Airline of Sabah and Sarawak, is bringing in the new year with its new Ground Operations staff uniform as part of its continuous effort to enhance its brand. This uniform will see a more refreshed version of the former—a shade of emerald for women, and a clean white shirt with MASwings and Malaysia Airlines’ logo for men. The newly refreshed uniform embodies the company’s identity and would welcome customers with a bolder look. This change is in line with the company’s direction towards a more customer service centric. “Also, both uniforms reflect the warmth, unique Malaysian values and hospitality that are well known to all our guests,” he added. Customers will be able to see the new Ground Operations uniform in Airports across East Malaysia beginning today. 05 JANUARY 2015, KOTA KINABALU: In celebration for the Malaysia Year of Festivals 2015 campaign (MyFEST 2015), MASwings is rolling out with its X-Fare promotion with base fares from as low as RM10*, to selected domestic destinations. Travellers from Kota Kinabalu can enjoy the offer to domestic destinations such as Tawau, Sandakan, Labuan and Miri. Not forgetting, those who are travelling from Kuching will also be able to enjoy the same fare to Bintulu, Sibu and Miri. This irresistible promotion, are up for grabs from now until 31 January 2015, with travel period from now until 31st March 2015. The fares are not inclusive of airport taxes, fuel and insurance charges, which start from RM59 one-way, and subject to MASwings terms and conditions. 24 DEC 2014, KOTA KINABALU: With the community of Sabah and Sarawak in the spirit of celebration and holiday, MASwings is bringing the spirit of giving to their in-flight services with cabin crews donning the signature red Santa hat and passing out cookies covered in white and pink icing, enhancing the celebration of Christmas. In this season of joy, family and friends come together to spend quality time to rekindle old relations, partake in merry making and reminisce good times before everyone embarks to a new year. MASwings would like to bring the same spirit of gratitude to the same community, which have supported the company through the years and hope to strengthen the relationship between the company, the staff and the people. “We are grateful and appreciative of the people of Sabah and Sarawak whom had supported us for so long, we believe passengers from both within and outside of Sabah and Sarawak would bring good memories from their flight with MASwings, on top of sharing it with their friends and family in conjunction with the celebration.” Added Captain Ritzerwan Rashid. This event will be ongoing for two days, 24th and 25th December 2014 for all MASwings passengers across selected destinations. MASwings, the regional subsidiary airline of Malaysia Airlines, has been operating in Sabah and Sarawak community is entering its eight-year of service, and continues to serve as the community’s airline and reliable connectivity. 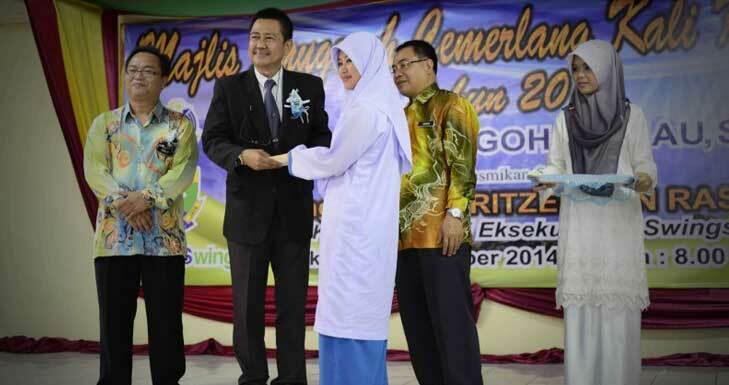 04 NOV 2014, RANAU: MASwings sponsored RM1,600 worth of prizes which was given out during SMK Kemburongoh’s Excellence Award Ceremony to celebrate the student’s academic achievements on 30th October 2014. Upon arrival to the school, students dressed in Ranau cultural attire welcomed En. Nasip Roslan, MASwings Chief Operating Officer, who represented MASwings CEO to the event, with Gongs and traditional dance performances which truly captured the beauty of Sabahan culture. The ceremony was finally officiated by En. Nasip Roslan, by blowing a 'sumpit' at balloons, revealing a welcome banner to the crowd. SMK Kemburongoh has been part of MASwings Corporate Social Responsibility Program since 2012 through activities aimed towards developing the students' learning and development. Part of the activities includes annual study trips to Kuala Lumpur and Putrajaya for selected high-achieving students in hopes that it will expand their horizons as well as preparation seminars to equip students facing their national examinations. MASwings will also be extending further donations of RM6,000 worth of academic books to the school's library to assist the students with their learning and major examination preparations. At the end of the Excellence Awards Ceremony, SK Kemburongoh Headmaster, En. Habdin Ariffin presented a token of appreciation to MASwings. MASwings believes in the importance of education and as a way to invest in the future of Sabah and Sarawak communities. 20 OCT 2014,KOTA KINABALU: In response to Daily Express’ article titled, ‘MASwings may shift operations to Sabah’ and published on the 20th October 2014, Monday. MASwings did have a liaison office in Subang, Selangor as a touch-point between MAS operations and MASwings but have since been closed effective 1st October 2014 as one of MASwings Chief Executive Officer, Captain Ritzerwan’s initiative. 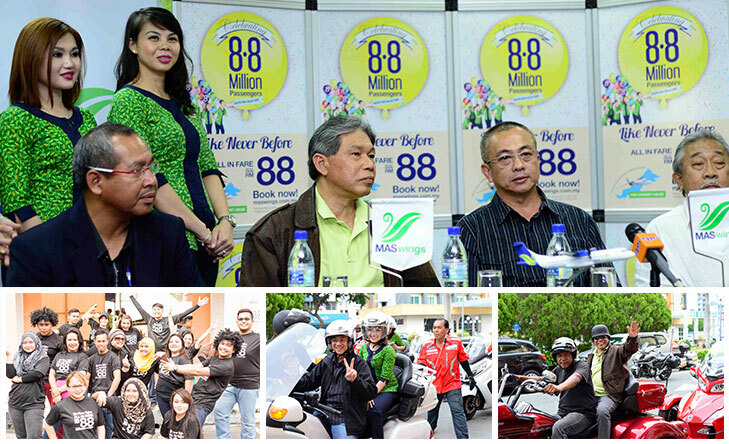 18 OCT 2014, MIRI: MASwings Travel Fair Roadshow RM88 'Like Never Before' promotion comes to Miri this weekend! Be sure to catch up with the MASwings team at Miri's Permaisuri Imperial City Mall on 18 and 19 October, from 10.00am to 9.00pm. On offer will be attractive and affordable fares of RM88 to destinations in Sabah and Sarawak. 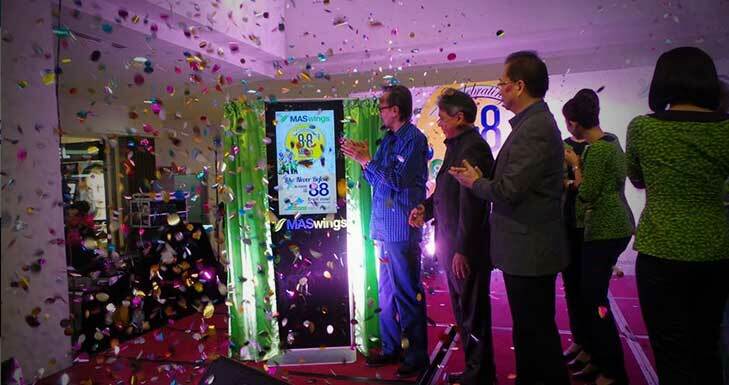 The highly popular RM88 'Like Never Before' promotion was launched in Kota Kinabalu, Sabah, in conjunction with MASwings' celebration of flying 8.8 million passengers since it began operations in 2007. Now into its 8th year of service, MASwings continues to be the preferred airline to connect communities in Sabah and Sarawak. After two successful events in the Land Below the Wind in Kota Kinabalu and Labuan, the MASwings Travel Fair Roadshow RM88 makes its entry to the Land of Hornbills in Miri this weekend. "This travel fair is our way of saying Thank You to our loyal guests. It is a reward for the strong support and great response from the public that has enabled MASwings to fly 8.8 million passengers since 2007", said MASwings' Chief Executive Officer, Captain Ritzerwan Rashid. "The roadshow around Sabah and Sarawak is a good platform for us to strengthen ties with the public as well as our key partners so that we can improve our services and develop even better travel options and packages. Come over and meet our team." The 2-day roadshow in Miri will include fun-filled activities and performances, including a special appearance by Nadia from Akademi Fantasia Season 6. Visitors to the MASwings travel fair will be able to get first-hand exclusive fares of RM88 for one-way all-in deals to any destination in Sabah and Sarawak. Other attractions include the chance to win free flights and merchandise giveaways by participating in the activities throughout the fair. The irresistible RM88 promotion is up for grabs from now until 31 December 2014, with travel period from now until 31 March 2015. The fares are inclusive of airport taxes, fuel and insurance charges, and subject to MASwings" terms and conditions. 30 SEP 2014, KOTA KINABALU MASwings will be suspending its four times weekly services from Kuching to Bandar Seri Begawan via Mulu effective 26 October 2014. 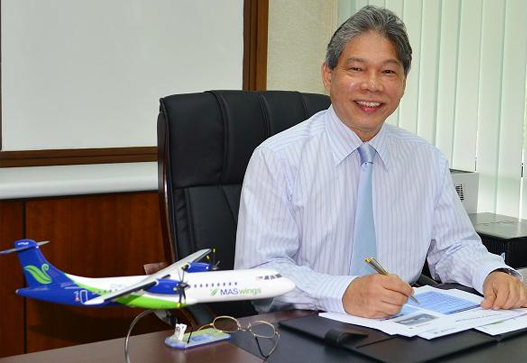 The decision to suspend the Kuching – Mulu – Bandar Seri Begawan route is part ofMASwings’ network rationalization for the community airline to focus on growing its domestic routes, which is also its core market. All affected MASwings’ guests will be notified via email, SMS blast and calls. They will be offered options to change their travel plans to an earlier date or be fully refunded. MASwings regrets the inconveniences caused due to these changes and assures that all bookings throughout the affected dates will be honoured. Passengers can continue to fly daily from Kota Kinabalu to Bandar Seri Begawan on MASwings code share flight with Royal Brunei Airlines. For further assistance, customers may visit MASwings ticket offices, call their respective travel agents, or contact Malaysia Airlines’ 24-hour Call Center at 1300 88 3000 (within Malaysia) and +6 03 7843 3000 (outside Malaysia). 27 SEP 2014, LABUAN: MASwing celebrated flying 8.8 million passengers since its first operation in 2007, by rolling out a promotion ‘Like Never Before’ which offers attractive and affordable fare of RM88 to any destinations within Sabah and Sarawak. After launching the prestigious ceremony in Kota Kinabalu Sabah, MASwings is bringing the celebration to the Pearl of Borneo with its very first MASwings’ Travel Fair Roadshow (MTFR) starting from 26th September – 28th September 2014 at Wisma Perbadanan Labuan. The “Promotion Like Never Before” deals are open for everyone starting from 2.00pm – 6.00pm on Friday and from 10.00am – 6.00pm on Saturday and Sunday. MASwings Travel Fair Roadshow will feature great fun-filled activities throughout the three-days, in conjunction with various tourism bodies. Visitors of the fair will be able to get first hand exclusive fares of RM88 one-way all-in deals to any destinations within Sabah and Sarawak and stand a chance to receive free flights and merchandise giveaways. Apart from that, there will also be an array of performances as well as ‘special’ appearances from MASwings’ in-house talent. This irresistible promotion is up for grabs from now until 31 December 2014, with travel period from now until 31 March 2015. The fares are inclusive of airport taxes, fuel and insurance charges, and subject to MASwings’ terms and conditions. 13 SEP, KOTA KINABALU: By August 2014 MASwings had carried its 8.8 millionth passenger, marking a significant milestone for the community airline. MASwings will be entering its 8th year of service connecting communities in Sabah and Sarawak since it first operated in October 2007. To celebrate the 8.8 million guests flown, MASwings is rolling out a special ‘Like Never Before’ promotion. Passengers travelling from Kota Kinabalu will be able to enjoy one-way all in fares to Sandakan, Tawau, Lahad Datu and Labuan, from as low as RM88. Those travelling from Kuching will also be able to enjoy the same fares to Bintulu, Mulu, Sibu and Miri. Passengers from Miri can also travel to Limbang, Bintulu and Sibu, respectively with the same amazing offer. This irresistible promotion is up for grabs from now untill 31 December 2014, with a travel period from 10 September 2014 – 31 March 2015. The fares are inclusive of airport taxes, fuel and insurance charges, and subject to MASwings’ terms and conditions. “With continued growth across the MASwings network, we look forward to our progress, in which we hope to connect to more destinations and serve more passengers. 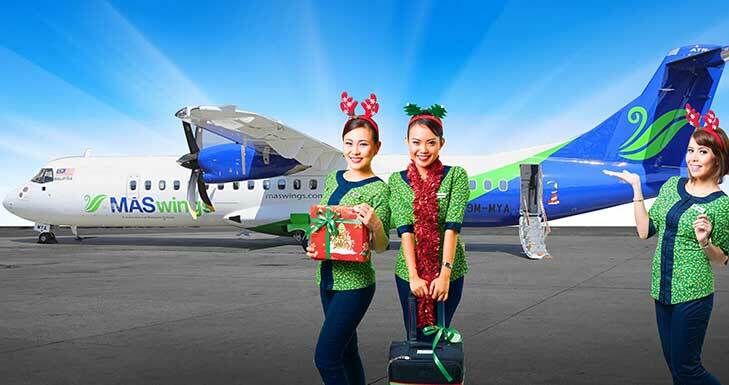 ” He added, announcing that MASwings also plans to take delivery of its 4th ATR 72-600 in October 2014. 29 AUG 2014, KOTA KINABALU: MASwings will be withdrawing its thrice-weekly services from Kota Kinabalu to Puerto Princesa, effective 1st September 2014 until further notice. Despite the need to suspend Puerto Princesa route, MASwings will be taking this opportunity to focus and expand on its domestic network where demand outlook is strong and will be done via increased connectivity for the benefits of the community in Sabah and Sarawak. MASwings’ guests whom are affected by the suspension of this route will be offered options so to alleviate as much inconveniences as possible. All affected guest have been notified via their registered email account as well as from an SMS notification sent out in regards to the route suspension. All booked and ticketed passengers will be offered to move their flight to an earlier or new date within the month of August 2014 with a revalidated ticket without any extra charges and subject to seat availability. For all booked and not ticketed passengers, guest will be offered alternate date in August 2014 or may choose to cancel their booking and will be fully refunded. Kota Kinabalu to Puerto Princesa route will remain its flight operation on Tuesday, Friday and Sunday until 31st August 2014. MASwings is regretful for the inconveniences caused to all affected parties as a result from these changes and assures that all bookings throughout the affected dates will be honoured. Customers may call the 24-hours call center at 1 300 88 3000 for further assistance. 28 AUG 2014, KUCHING: In welcoming the spirit of Hari Kemerdekaan and Hari Malaysia, MASwings and Firefly is launching the Cabin Crew Integration Programme for the second year as part of a continuous effort to strengthen the Groups’ ambition of greater national integration. This colourful programme will feature 10 MASwings cabin crew from East Malaysia flying alongside Firefly crew on flights around Peninsular Malaysia, and vice versa for another 10 Firefly cabin crew to be integrated into MASwings’ flights and routes. “The first cabin crew exchange programme held in 2013 was a success. Passengers on both airlines were exposed to the different brand identities each airline embodies. Our staff were also exposed to the diverse cultures within each Malaysian state. We are glad that we are able to conduct this programme once again as we intend to strengthen bonds within our Malaysia Airlines group and join the Nation in celebrating Merdeka with a more colourful and patriotic spirit in this trying time”, said Firefly CEO, Ignatius Ong in echoing the sentiment. All 20 cabin crew assigned for this exciting programme have been sent for training to equip and prepare them with the differences in operation and services of the respective carriers. This further benefits both airlines’ cabin crew knowledge and credibility as they are given the opportunity to experience other carrier as well as the colourful diversity between states that is the core of Malaysia. 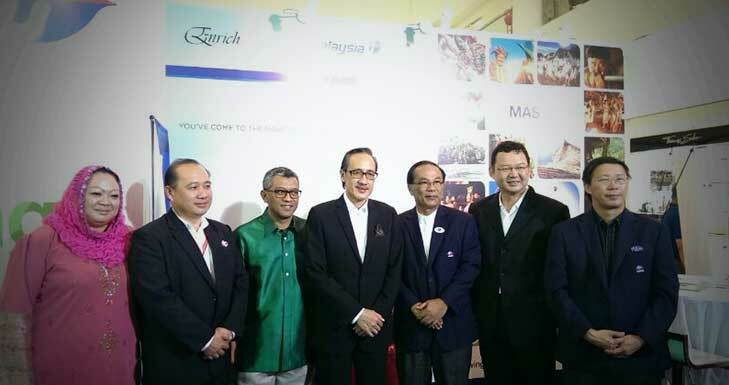 Passengers flying MASwings and Firefly would be able to be part of this unique experience through the integration programme which will run for two weeks from 28th August 2014 to 11th September 2014 for both airline carriers. MASwings, the regional subsidiary airline of Malaysia Airlines, operating for Rural Area Services (RAS) in Sabah and Sarawak continues to serve as the community’s airline and reliable connectivity. Firefly currently flies to domestic and regional destinations out of Penang and Subang, connecting secondary destinations within the Indonesia-Malaysia-Thailand Growth Triangle. 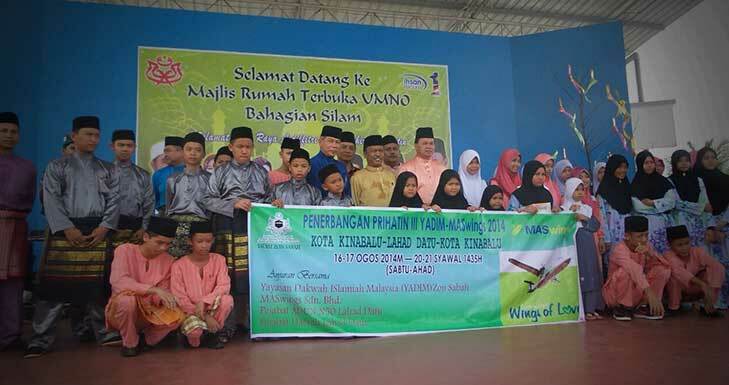 17 AUG 2014, KOTA KINABALU: MASwings have made it possible for 37 orphanage children and 3 of their caretaker to take flight from Kota Kinabalu to Lahad Datu for an educational trip from on 16th to 17th August 2014 in partnership with Yayasan Dakwah Islamiah Malaysia – YADIM Zon Sabah. Excitement and joy were clearly expressed by the 37 selected orphanages out of 3 welfare homes as for some; this would be their first time travel in an aircraft. These orphanages represent the Rumah Anak Yatim As-Sakinah, Papar; Rumah Anak Yatim Al-Aman, Beaufort and Yayasan Kebajikan Suria, Tuaran. This is the third time MASwings have supported the ‘Program Penerbangan Prihatin’ with YADIM and aim to continue meaningful partnerships such as this through various methods, especially for those whom are underprivileged and hails from remote areas within Sabah and Sarawak. The orphanage children experienced a two-days one-night trip to Lahad Datu by flying with MASwings with some being their first time on a flight. Their trip include visits to Lahad Datu district office to explore and be informed of the city’s history and background. At the same time, they also had the opportunity to attend functions with YB Datuk Muhammad Yusof Apdal, ADUN N.50 Lahad Datu as well as YB Datuk Haji Nasrun Mansur, Ahli Parlimen P.188 Silam. Upon returning home to Kota Kinabalu, the children were filled with refreshed energy and excitement after experiencing a whole new world and with them new knowledge and a whole lot of possibilities. MASwings as the reliable community airline continue to strive the best for the community development of Sabah and Sarawak through various engagement, focusing on Community, Education, and Environment. Kota Kinabalu - Excitement and joy were clearly expressed by the 32 selected orphanages out of 3 welfare homes for their first time travel in an aircraft early this morning from Kota Kinabalu to Sandakan. This was made possible by MASwings thru its Wings of Love aspiration and support towards the educational program initiated by Yayasan Dakwah Islamiah Malaysia – YADIM, Zon Sabah. These orphanages represent Rumah Anak Yatim As-Sakinah, Kota Kinabalu; Rumah Anak Yatim Al-Aman, Beaufort and Rumah Anak Yatim Darul Bakti, Kota Belud. “This is the second time around MASwings is supporting the program under YADIM and we will strive to be firmly committed to meaningful initiatives such as this program thru various methods especially for those underprivileged who hails from remote areas within Sabah and Sarawak.” said Capt Nawawi. "Most of these orphanages have never been elsewhere but their own hometown and flying on an aircraft such as MASwings ATR for the first time is something they have never dreamed of hence the valuable experience and exposure gain would give them the motivational push to excel better in their study and future endeavor. We hope and believe that by the use of our resources and contribution, it will bring about positive changes in the community, especially to these young generations and the country as a whole.” Capt Nawawi further added. 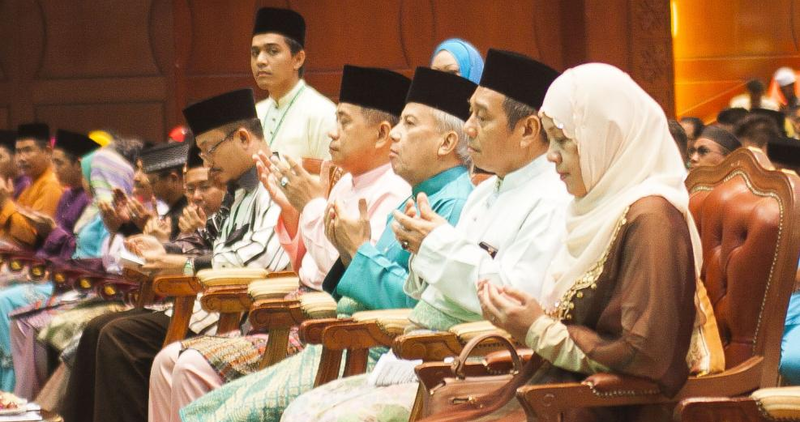 The orphanages who are led by Tuan Haji Samin Ongki of YADIM Zon Sabah and the respective homes guardians are expected to be attending a „Majlis Aidilfitri‟ event hosted by Sabah Chief Minister this evening at the latter‟s residence. The group is expected to return from Sandakan on Monday morning. 25 JUL 2014, KUCHING: MASwings once again brings the air of festivity on board their selected flights within Sabah and Sarawak with cabin crews donning the traditional Baju Melayu and Baju Kurung. This will be in conjunction with the widely welcomed celebration worldwide- the Hari Raya Aidilfitri. In the month of Ramadhan, Muslims all over the globe fasted through the days and the new month of Syawal is greeted with an air of togetherness, forgiveness and new beginnings. It is also an opportunity for family members to rekindle old relations, partake in merry making and paying respects to the elders. MASwings would like to bring this spirit to the same community, which have supported the company through the years and hope to strengthen the relationship between the company, the staff and the people. According to MASwings Chief Executive Officer, Captain Ritzerwan Rashid, "This initiative is an effort bring MASwings closer to its community, starting with the people who travel between the cities of Borneo." "Travelling can be tiring to some people, and we would like to bring a touch of home to our passengers. We anticipate passengers from both within and outside Sabah and Sarawak to take photos with our beautiful cabin crew in full Baju Melayu and Baju Kurung costume, and share it with their family and friends as a happy memory of their flight on MASwings, especially on such a widely celebrated festivity”, added Captain Ritzerwan Rashid. The launch of cabin crew wearing Baju Melayu and Baju Kurung costumes was officiated earlier today by the Assistant Minister of Tourism Sarawak, YB Datuk Hj Talib Bin Zulpilip, at MASwings VIP Media Room at Kuching International Airport. MASwings, the regional subsidiary airline of Malaysia Airlines, has been operating in Sabah and Sarawak community for nearly seven years, and continues to serve as the community’s airline and reliable connectivity. 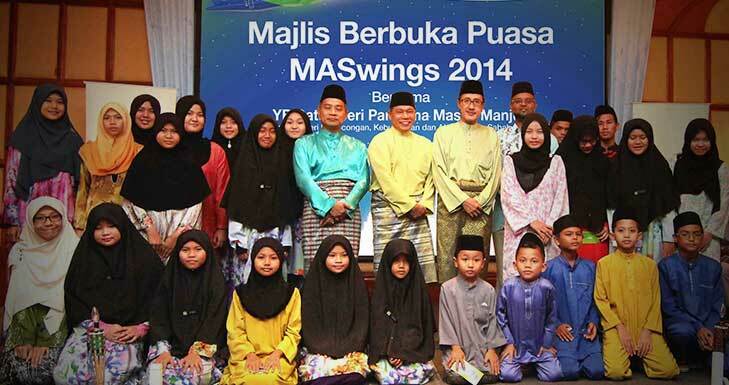 15 JUL 2014, KOTA KINABALU: In conjunction with the holy month of Ramadhan celebration, MASwings held a berbuka puasa (Breaking of Religious Fast) event at the Le Meridien Hotel Kota Kinabalu with YB Datuk Seri Panglima Masidi Manjun and welcomed all MASwings affiliated stakeholders, media partners as well as 26 children from Rumah Anak Yatim As-Sakinah. Our new CEO, Captain Ritzerwan Rashid said in his opening speech that he is grateful for everyone’s attendance and the support they have given to MASwings throughout the years. He believes that gathering such as this are beneficial to each party involved as it cultivates closer relationships and spreads joy. Apart from gathering to break fast together, MASwings also took this opportunity to work alongside Yayasan Dakwah Islamiah Malaysia (YADIM) and invite children from the orphanage home to join for a festive celebration. YB Datuk Seri Panglima Masidi Manjun with Captain Ritzerwan Rashid was welcomed on stage to give each and every child a ‘Hari Raya’ packet. 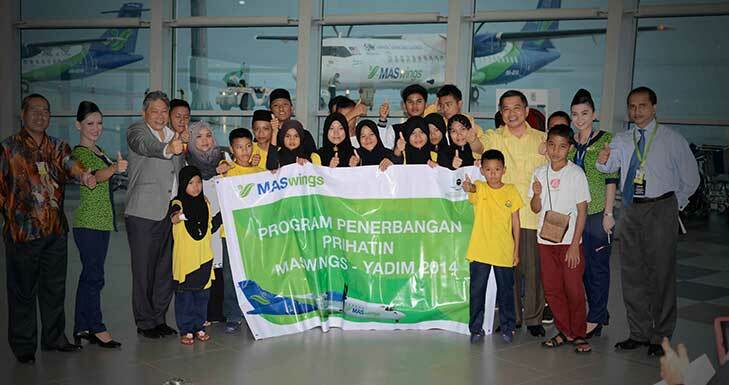 MASwings will continue to engage with YADIM through our annual partnership ‘Program Penerbangan Prihatin MASwings-YADIM’ which this year, we will be flying 40 children from the orphanage house from Kota Kinabalu to Lahad Datu on 16th to 17th August 2014. Last year, we flew 30 children to Sandakan under the same program for a motivational program and Aidilfitri celebration with Sabah’s Chief Minister, YAB Datuk Sari Panglima Musa Hj Aman. MASwings is continuously building an effort to bring together a closer relationship between MASwings staff, stakeholders, and the community through events, which benefit across communities such as this. 04 JUL 2014, KUALA LUMPUR: MASwings is back at MATTA Fair 2014 happening on 4-6 July 2014 at Suria Sabah Shopping Mall, Kota Kinabalu, with up to 80% discount on fares and fares from as low as RM89 on MASwings domestic routes. One-way all in fares, from as low as RM89, can be enjoyed for travel from Kota Kinabalu to Sandakan, Labuan, Tawau and Kuching. Passengers from Kuching can enjoy RM89 fares to Bintulu, Sibu, Mulu and Kota Kinabalu. Passengers from Bintulu also enjoy these amazing offers for travel to Kuching, Miri and Kota Kinabalu. According to MASwings Chief Commercial Officer Shauqi Ahmad, “With these attractive fares, it is easy to travel to visit the many wonderful local destinations we have. Or why not take the opportunity during the coming festive season or school holidays to explore MASwings’ International BIMP-EAGA destinations. Book early to avoid disappointment. With these great deals, we expect seats will be snapped up fast” said Shauqi. International promotional fares are available on MASwings’ BIMP-EAGA routes starting from as low as RM136 for one-way all in fares to Tarakan from Tawau, and RM176 to Puerto Princesa from Kota Kinabalu, and to Bandar Seri Begawan from Kuching. These irresistible promotions, available from now till 23 July 2014, are great value-for-money with up to 80% discount off current market fares. The travel period is from 23 June 2014 – 13 August 2014. The fares are inclusive of airport taxes, fuel and insurance charges, and subject to MASwings terms and conditions. MASwings’ offers at MATTA Fair 2014 will be sold alongside parent company, Malaysia Airlines which is also promoting its Mid-Year Marvels sale. Apart from amazing offers, visitors at the Malaysia Airlines/MASwings booth can also look forward to a fun-filled line-up of activities, such as Children’s Colouring Contest, Best Photo of the Day Contest and stand a chance to win attractive prizes, including return Economy flight tickets to selected MASwings’ destinations and MASwings’ limited edition aircraft models. The above offers are also available through MASwings / Malaysia Airlines ticket offices, via 24 hours Call Centre at toll free number 1300 88 3000 and appointed travel agents within Malaysia. More information on the above fares and flight schedules are available on MASwings’ website www.maswings.com.my. 19 JUN 2014: A MASwings ATR72-500 aircraft operating flight MH3041 from Kota Kinabalu to Labuan which departed at 0730 hours today landed safely in Labuan Airport at 0800 hours. The aircraft was carrying 55 passengers and four crew. Upon descend towards Labuan Airport, one of its engines developed a technical anomaly. As per standard operating procedure, the operating captain immediately informed the Labuan ATC and a full aerodrome support services was activated. All necessary procedures were executed. It was found that the number two engine inboard cowling board had detached itself and was found on the runway at Kota Kinabalu International Airport. No untoward incident was reported, however as safety is of utmost importance to the airline, the aircraft is currently grounded to allow for engineering inspection and maintenance before returning to service. 07 JUN 2014, KOTA KINABALU: For the first time, MASwings organized a ‘Ceramah Perdana’ with the topic ‘Hikmah Disebalik Cabaran dan Dugaan Hidup’, open for the public attendance at Dewan Canselor, Universiti Malaysia Sabah (UMS). This event was held in collaboration with Universiti Malaysia Sabah (UMS), Yayasan Dakwah Islamiah Malaysia (YADIM) and Jawatan Kuasa Islam MAS/MASwings Sabah dan Sarawak (JKIMM SS). MASwings Advisor and former CEO, Datuk Captain Nawawi Haji Awang said he was proud to see more of MASwings initiatives for employees and the community were coming to fruition. MASwings from staff across Sabah and Sarawak joined the public to attend the ceramah talk. MASwings has hosted multiple other events since its establishment in 2007 to build strong connections between the airline and the community. Among them were the Buka Puasa (Breaking of Religious Fast) Event with the Underprivileged Students, Orphans, and Residents of Kampung Ketiau Putatan and Kampung Tanjung Aru Baru and Lama, Sabah and the Christmas Celebration with Cancer Children at Sarawak General Hospital and Autistic Centre to share the joy of holidays with those who needs it most. It is MASwings greatest hope to do more community engagement through likeminded events together for the good public and MASwings staff towards a better understanding with each other. These efforts are part of MASwings' endeavours to be a true community airline. The invited speaker, Ustaz Mohd Kazim Elias, is a highly renowned orator in Malaysia for issues regarding Islam and the community. His approach which is both entertaining and comedic, has greatly contributed to his popularity among society across all backgrounds and ethnicity. Ustaz Mohd Kazim hails from Batu Kurau, Perak and has started his effort on ‘dakwah’ since the early 1900 but it was not until 2001, after the establishment of Sedaya Irham, a dakwah centre in his hometown that really shoots his name to fame. Today, he is the Chairman and Headmaster of Al-Barakah Education Centre, focusing on Islamic studies for both adults and children. 04 JUN 2014, KOTA KINABALU: This is to announce that Datuk Captain Mohd Nawawi Haji Awang has officially retired from the Group and Company as Chief Executive Officer of MASwings effective 31 May 2014. After 3 years tenures in MASwings, he and his team Warga MASwings have expanded the truly community airline to a recognized and designated BIMP-EAGA airline, taking MASwings beyond the borders of Sabah and Sarawak. A very commendable achievement under his leadership. We wish Dato’ Captain Nawawi “Happy Retirement” and the best of health and success in his future endeavors. Taking over the leadership of MASwings from 1 June 2014 will be Captain Ritzerwan Rashid. Captain Ritzerwan has held senior aviation management roles in Malaysia, India and Korea. His 40 years of extensive knowledge in the aviation industry and a higher academic qualification in Information Technology, Marketing and Management, have enabled Captain Ritzerwan to deliver the expected level of excellence in his previous work with Airbus, Boeing, Jet Airways (India), Asiana Airlines (Korea) and of course in our home grown national carrier, Malaysia Airlines. Some of his many achievements include Best Employee Award at Asiana Airlines, pioneering work in aircraft and flight simulator programmes, new aircraft introduction, and the reorganization and management of airline operational divisions. 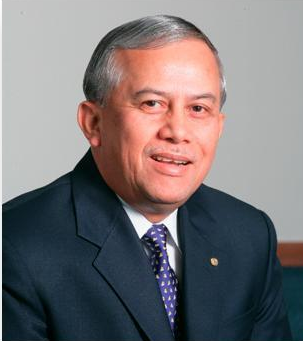 Outside of the aviation industry,in 1985, Captain Ritzerwan co-founded and pioneered the first microcomputer design andmanufacturing facility in Malaysia. Captain Ritzerwan combines a valuable understanding of technical and information systems, business management, and airline operation, which he will now bring to MASwings. 02 JUN 2014, KOTA KINABALU: MASwings is increasing its flight frequencies from Kota Kinabalu to Puerto Princesa to five times weekly effective 2 June 2014. The increase in weekly flights from three to now five times follows high demand for connectivity from Kota Kinabalu to the popular tourist city on Palawan island in south western Philippines. From 2 June, MASwings will fly on Monday, Tuesday, Thursday, Friday and Sunday. MASwings began flying to Puerto Princesa in November 2013 with the thrice-weekly service schedule. Less than one year later, due to high demand from both tourists and trade, MASwings has decided to increase its flight frequency to five times weekly. As a city within the growing BIMP-EAGA Growth Area, connectivity offered by MASwings is an important catalyst to economic growth. Palawan Island has been ranked the 8th Best Island in Asia by Trip Advisor Travellers' Choice Island Awards 2014. MASwings operates the two-class configured ATR72-500 aircraft with 60 Economy class seats and 4 Business class seats for this Kota Kinabalu - Puerto Princesa return service. Flight MH3992 departs Kota Kinabalu at 11.35 am and arrives at Puerto Princesa at 13.05 pm, while the return flight MH3993 departs Puerto Princesa at 13.30 pm and arrives in Kota Kinabalu at 3.00 pm the same day. For bookings, contact 1 300 88 3000 to proceed to a Malaysia Airlines / MASwings ticket office or appointed agents throughout Malaysia. 28 MAY 2014, KOTA KINABALU: The beautiful colours and designs of Sabah and Sarawak’s ethnic groups’ traditional dress will make for an extra special journey for MASwings’ passengers over the Kaamaatan and Gawai Dayak festivals this June when cabin crew of the community airline will wear their celebration attire. For the peoples of Sabah and Sarawak, these harvest festivals are the biggest celebrations in the year. 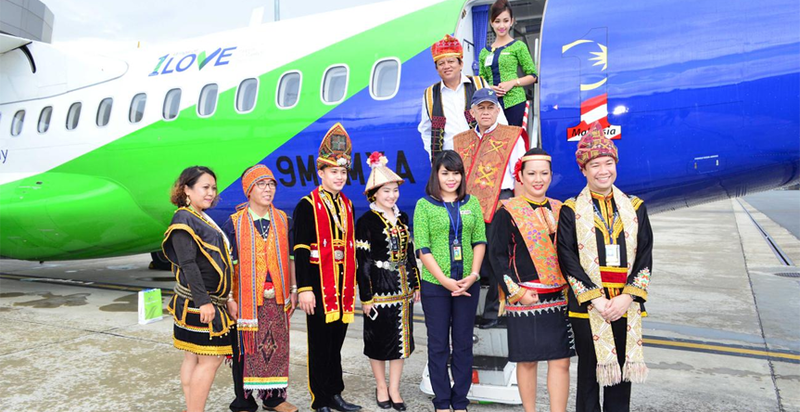 Just for the festivities, cabin crew will be dressed in various Sabah and Sarawak ethnic traditional costumes on board selected MASwings’ flights throughout the week of Kaamaatan and Gawai that begins at the end of May into early June. “We anticipate passengers from both within and outside Sabah and Sarawak to want to take photos with our beautiful cabin crew in full traditional costume, and share it with their family and friends as a happy memory of their flight on MASwings during Kaamaatan and Gawai this year”, added Dato’ Captain Nawawi. This launch of the cabin crew wearing traditional attire over the harvest festivals was officiated earlier today by Sabah Tourism Chairman, Datuk Joniston Bangkuai, at Malaysia Airlines’ Golden Lounge at Kota Kinabalu International Airport. MASwings, the regional subsidiary airline of Malaysia Airlines, has been operating in Sabah and Sarawak community for nearly seven years, and continues to hold true to its goals by contributing to the growth of BIMP-EAGA sub-region and serving as the community’s airline and reliable connectivity. 19 MAY 2014, KUALA LUMPUR: Forty-five students and seven teachers from eight schools in Sabah and Sarawak had a time of their lives when they boarded flight Malaysia Airlines MH2607 and MH2593 for a trip to 3 days, 2 nights trip to Kuala Lumpur starting Sunday, 18 May 2014. The team from SMK Kemburongoh Ranau, SK Rosob Pitas, SK Gayang Tuaran and SK Kimanis Papar in Sabah, SK Bario, SMK Bario, SMK Ba‟kelalan and SK Kuala Baram 2 ,from Sarawak, flew from Kota Kinabalu and Miri on a study visit to Kuala Lumpur,courtesy of MASwings and Petronas. The study trip is part of MASwings‟corporate social responsibility (CSR)programme called “Wings of Love” which focuses on community, education and environment initiatives. For this year‟s education initiative, MASwings collaborated with PETRONAS to give the visiting students and teachers an exciting twist to their trip. A visit to the world famous PETRONAS Twin Towers and Petronsains was included into the 3 days programme. The study trip also included a visit to Malaysia Airlines‟ Academy to see up close how the award-winning Malaysia Airlines cabin crews are trained. "It is so rewarding to see the big smiles on the faces of students and teachers alike throughout the trip. To know that they are learning so much more from the new experiences by getting the opportunity to travel is the best reward for MASwings”, added Datuk Captain Nawawi. For nearly seven years, MASwings has successfully implemented a number of activities under its “Wings of Love” programme. Berita Harian to hold educational seminars to help students prepare for the UPSR, PMR and SPM national examinations. MASwings recently launched its very own „Kad Pelajar‟ for discounted student travel. Specially created for schools served by the RAS (Rural Air Service) in Sabah and Sarawak, „Kad Pelajar‟ holders will enjoy 50% discount on all of MASwings domestic routes. Application for „Kad Pelajar‟ is free for students from the age of 7 to 17 years. For more information, log on to MASwings newly revamped website at www.maswings.com.my.